Much of the research previously showcased on Journeys to the Ice required highly complex fieldwork systems: oceanographic research vessels and drilling rigs can be stunningly expensive to operate, and may require months of concerted, 24-hour effort by legions of scientists and support staff. The science in this episode of the podcast harks back to the old school of Antarctic field geology. In late 2005, three ARC scientists were dropped off on a barren expanse in the McMurdo Dry Valleys armed only with a couple of spades, a measuring tape, a sachet or five of margarita mix (no room for beer in helicopter cargo allowances unfortunately), and with pockets stuffed with sample bags, set out to see what paleoenvironmental tales might be hiding beneath their mukluk-clad feet. 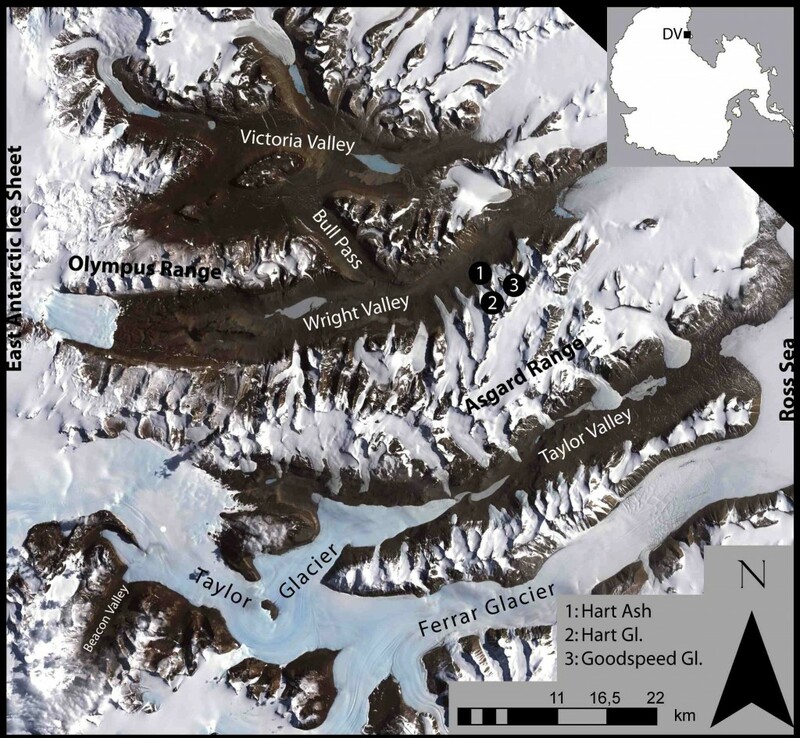 These valleys are formerly glaciated, but are currently ice-free due to rapid uplift of the Transantarctic Mountains, which has locally halted the discharge of the East Antarctic Ice Sheet to the Ross Sea. Within the valleys, the sublimation rate far exceeds the negligible delivery of snow, resulting in a frigid desert environment that has been used as a terrestrial analogue for the surface of Mars. The term ‘soil’ is used loosely in the Dry Valleys — these are not the rich, fertile loams we enjoy here in New Zealand. The outwardly monotonous, highly saline, rocky sediments of the valley floors are devoid of organic material (apart from patchy populations of nematodes), but can contain interesting geochemical signals that the macroscopic profile belies. 10Be is a radioactive isotope of beryllium (1.4Ma half-life) that forms in the atmosphere from spallation reactions between incoming cosmic ray radiation and oxygen or nitrogen target nuclei. The free radionuclide binds to aerosol particulate matter and is quickly brought to the Earths surface in precipitation or dry fallout. In temperate and tropical regions, this radionuclide commonly makes its way down through the soil by fine particle translocation within percolating meteoric water, or in acidic solutions. The parched polar desert of the McMurdo Dry Valleys suffers no such pedological processes today, so when the then-Bavarian masters candidate, Martin Schiller (actually he’s still Bavarian but now has a PhD to boot), discovered a classic 10Be decay profile in a buried soil in the lower Wright Valley, he knew he must have opened a window onto an (at least marginally) warmer, wetter local climate of the past. The paleosol was overlain by an in situ 3.9Ma volcanic ash. Radiometrically dated tephras like this are usually ideal temporal marker horizons, but in this case, turned out to be a mixed blessing. Being devoid of 10Be, the ash’s presence dictated that the paleosol, and its accompanying paleoclimatic setting, must have been at least 4 million years old and therefore potentially active during the Pliocene. However, due to the release of large amounts of mineral-bound, stable 9Be during the laboratory procedure, the proposed decay-based dating model — based on the down-profile ratio of naturally weathered 9Be to atmospheric 10Be — was rendered unusable. While Martin’s work is a valuable addition to the growing body evidence supporting significant Late Cenozoic climate variability in the Ross Sea region (e.g. ANDRILL) it also serves as a lesson in just how tough the dating game can be.